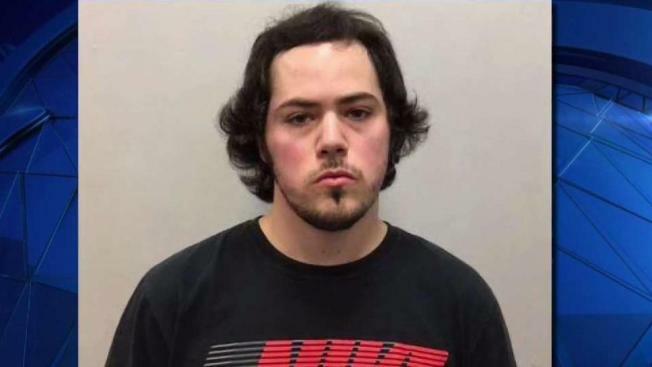 A man arrested in connection with a brutal attack on a woman outside a Planet Fitness gym in New Hampshire is expected to be released on personal recognizance bail on Tuesday night or Wednesday after waiving arraignment. Police arrested Jordan Lamonde, 22, of Portsmouth, on Monday, in connection with the June 12 attack. He is charged with second-degree assault and was initially ordered held on $150,000 bail pending arraignment. The victim showed up to Strafford County Superior Court Tuesday morning in hopes of coming face to face with her alleged attacker, but because he waived his arraignment, that didn't happen. Now, she's left with questions that she hopes will be answered someday. "Why, is my most PG rated thing I could say to him," Erin McCarthy told reporters outside the courthouse. McCarthy was brutally attacked in the Planet Fitness parking lot. She had no idea who was responsible until recently. "I'm really glad that he's been arrested, finally," McCarthy said. Rochester Police arrested Lamonde Monday afternoon. As it turns out, McCarthy has a connection to him. "My ex robbed him," she said. "And it wasn't like 500 bucks, it was, like, a lot of money." According to newly released court documents, McCarthy's ex-boyfriend allegedly stole a safe with $30,000 in it from Lamonde. Police say Lamonde sat in the Planet Fitness parking lot for eight hours before he got out of his car and allegedly punched McCarthy almost 40 times. "The worst thing I got was these scars on my hand," McCarthy said. On Tuesday, Lamonde waived arraignment and pleaded not guilty, striking a deal with the state to be released from prison on his own personal recognizance. "He has no prior convictions, he has lifelong connections to the State of New Hampshire and the support of family," said Lamonde's defense attorney, John Durkin. Prosecutors say Lamonde will be wearing a GPS device to keep him away from the victim. "There's an exclusion zone placed around her residence any other places she might be," deputy county attorney Tim Sullivan said. "If he enters those zones, it would immediately notify us." But McCarthy says that's not enough. "It's been a long ride," she said. "I just want to see him get what's coming to him." This case now heads to a grand jury. Lamonde is charged with second degree assault and could face up to seven and half years in state prison.